Alan B. came in yesterday toting a picture that he asked for an ID on. These are the types of identification that I do not mind one bit! The IDs over the phone are virtually impossible - there is just no knowing what the bird could possibly be, which this case exemplifies... He had a Parakeet in his feeder. Little Keet probably escaped his home, at least we hope that he was not merely released. He will likely survive throughout the temperate season if he does not become a part of the food chain. Unfortunately for him, he doesn't have much in the way of defense skills for our indigenous wildlife. 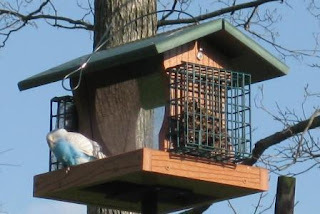 For now, Alan and his family will just enjoy the pretty blue bird on the feeder. Thanks for the pix, Alan! !